Janome 7034D is a good serger for home use. But there are better options available at a much lower price. Janome 7034D comes pre-threaded in the box. Most internal parts of this serger is made of metal. Janome hasn’t cut corners in build quality for sure. The machine sews beautifully on single and double layers of fabrics. It is not a great serger for multiple layers of thick fabrics. It definitely struggles with 2 plus layers of denim. The machine is slightly louder than usual , especially if you are not using a sturdy, wood sewing table. The thread guides are color coded but even then, it will be difficult for those with sight problems to see the guide without a flashlight or something. 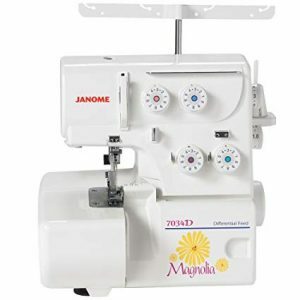 Janome 7034D is definitely not an industrial type serger. The performance of this serger will be good enough for home use though. It will be a good serger for basic use. But still, the price is not very appealing to me. It is slightly over priced I guess. Given a choice, I would rather go with Brother 1034D which has all the features of this serger and is a lot cheaper. It is one of the best entry level serger you can get in U.S. Brother 1034D has been the best seller ever since I started writing about sergers. So I would consider 1034D as a better option than this one.